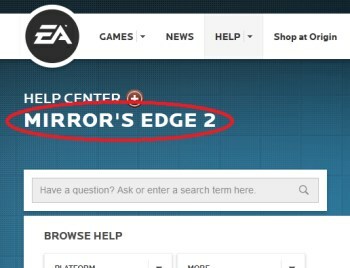 A Mirror's Edge 2 page briefly appeared on EA's Help Center site before being pulled back into the darkness from whence it came. With E3 rapidly approaching, the Mirror's Edge 2 rumors are stronger than ever. In case you missed it, an appearance of the game on Amazon.de, which has since been removed, is what got the ball rolling; it picked up speed with a similar there-and-gone turn on Italy's Amazon. Today it was spotted on an even more authoritative site: Electronic Arts' own help page, where it appeared this morning for awhile and then, like the Amazon entries, disappeared into the digital ether. It would seem very likely that we're going to see Mirror's Edge 2 at E3 and, since we're betting the farm, there's no question in my mind at this point that all these "unintentional" appearances of the game on various sites are in fact very intentional. Turning up a week apart on two credible (but non-English) Amazon sites, and then a "whoops, nothing to see here" at EA's home base? Come on. I'm willing to play along - I think rumors and guessing-game PR campaigns are fun - but let's not kid ourselves that this is anything but a calculated pre-E3 promotional campaign. Unless, of course, I'm wrong, and it really is just gross incompetence and Mirror's Edge 2 only exists in the dreams of fans who have many years of untended suffering ahead of them. Boy, that'll be some egg on my face.